Smartphone cameras from iPhones to Android models have only improved with each new iteration. However, one area where the reach of innovation still doesn't match the grasp is in the relatively chintzy zoom features still found on most cameras. But with this cool new zoom magnifier lens, you can shoot finer detail from a distance without the loss of quality. Make sure your far-away pictures start looking as brilliant as your close-ups with this clever new rig, available for just $28.99 (67% off) for a limited time. Set-up is simple…slip your phone into the gripping tripod, line up your lens and you'll instantly get zoom shots up to 8 times closer than with your unaided camera. The zoom magnifier will automatically change your perspective on what you can and can't shot with your smartphone. Sharp wide angle pictures like beautiful vistas or sunsets will now be possible, along with more precise action shots during sporting events or outdoor activities. 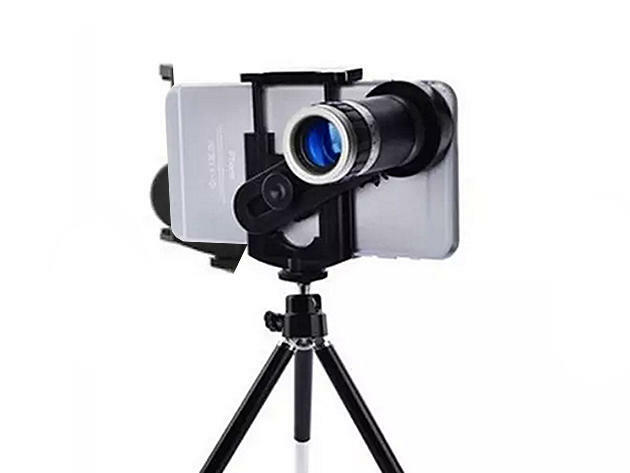 Why limp along with the meager lens on your smartphone when this simple attachment can open up a whole new world of options? Check out the difference by getting this nearly $90 value now for only $28.99 before this deal expires.